Spring is a magical time here at the CowChows. The tender new green on trees is at once soothing and exciting. Flowers in full bloom bring splashes of brilliant color into our lives, while others peek shyly from their buds with promise of things to come. The sweet courtship songs of birds awaken within us a sense of newness and romance. And, the opossums are everywhere. It's not my habit to rise before the sun, but on occasion life demands that I do. I was stirring about as day broke on the CowChows and I looked out from the kitchen window to see an opossum pacing across the back yard. I paused to watch, and then I saw another, and then another. My jaw dropped when the fourth waddled out from the trees by the shed, and then hit the floor when the fifth paced down the hill toward the house. I have never seen anything like it. The back yard looked to be working alive with opossums. I stood, thunderstruck, at the window, and then I had a thought. Wouldn't it be funny to see the backyard scattered with dead opossums? Not actually dead, of course, but playing dead like opossums are known to do. So, I crept out onto the back porch like a jungle cat and waited for the perfect moment. They continued to scamper about the backyard for a while but they kept their distance from each other. Then, as the day grew brighter they did the oddest thing. They seemed to be converging towards me. I couldn't believe it; it was perfect. I waited until they were just a few feet away and then I hopped down from the porch and began yelling and waving my arms like a crazy man. Opossums can be unpredictable. I thought they would drop in their tracks and play dead like opossums are supposed to do. Or maybe they'd scatter and run which would still be funny, but they didn't do either of those things. They stopped, looked at me for a long moment, and then they showed me those needle-sharp teeth, started hissing and charged straight at me like a rabid NFL offensive line. Things are kind of a blur after that. I've got a bum foot at the moment so I was kind of hop-running up the porch steps. I might, or might not have, screamed a little. I tripped on the threshold of the door and went sprawling to the floor but thankfully, crashing into the dining table kept me from doing any serious damage. I rolled over and kicked the door shut before those bloodthirsty vermin could get me. I learned a few things. 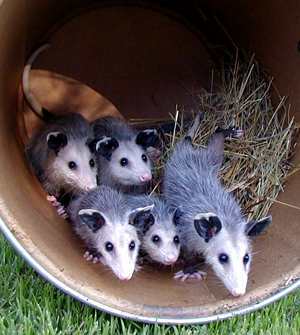 Apparently, a litter of opossums is being raised under our back porch. Apparently, the normally docile opossum can exhibit aggressive behavior if blocked from reaching a place of safety. Apparently, I'm not very threatening. Fortunately though, the opossum is nocturnal and I only use the backyard during the day. So, it's all good.